FAYETTEVILLE, Arkansas Wal-Mart Stores Inc. (WMT) announced a $15 billion share buyback program at its annual meeting on Friday, as the world's largest retailer faces increasing scrutiny from investors over how it has handled allegations of bribery in its Mexican operations that surfaced a year ago. Wal-Mart Stores Inc. brought the usual star power to its annual shareholder meeting, with "X-Men" and "Les Miserables" star Hugh Jackman hosting and singer John Legend entertaining. But the festivities took a serious turn as shareholders in the audience stood to make proposals related to safety in Bangladeshi factories, Wal-Mart's Mexican bribery scandal and executive paychecks. The company is facing pressure to increase its oversight of factory conditions abroad following a building collapse in April in Bangladesh that killed more than 1,100 garment workers. The discounter, based in Bentonville, Arkansas, is also under scrutiny for how it treats its workers. Those problems are happening as Wal-Mart Stores Inc. is wrestling with slower sales growth. Wal-Mart's annual meeting, at the University of Arkansas at Fayetteville's Bud Walton Arena, attracts thousands of investors and has historically had the air of a giant pep rally. Jackman opened the event by singing a rendition of "Oh, What a Beautiful Morning." The $15 billion share repurchase program replaces the current $15 billion share repurchase program begun in 2011. About $712 million is left under that program, Chief Financial Officer Charles Holley said. Wal-Mart is considered an economic bellwether because it accounts for nearly 10 percent of nonautomotive retail spending in the U.S. The company's first-quarter results, reported last month, showed that its low-income shoppers remain under stress. While the housing market is recovering and the stock market has rallied, low-income people haven't benefited much. They're also facing new pressures like higher payroll taxes that have affected spending. During the first quarter, Wal-Mart said its profit edged up just slightly, but the company reported its first decline in a key revenue measure in its U.S. namesake business in seven quarters. U.S. Wal-Mart stores account for 59 percent of the company's total sales, which reached $466.1 billion for the year ended Jan. 31, excluding revenue from membership fees from its Sam's Club division. Wal-Mart's U.S. namesake business had been roaring back after suffering a more than two-year slump after the company fixed mistakes in pricing and merchandising. It restocked thousands of items after eliminating them as part of a campaign to declutter the stores. It also has returned to its everyday-low-price message, after straying from that core philosophy by temporarily slashing prices on select items. Now, Wal-Mart is trying new ways to rev up growth in its U.S. business. It's trying to tailor merchandise to clusters of stores that attract similar shoppers. At its Sam's Club division, which has seen its small-business members increasingly strapped, it's lowering prices on key items. Overseas, it's working to increase profitability and sales in such markets as China and Brazil. Above all, Wal-Mart is trying to answer labor-backed critics by coming out with a three-part plan the company says can help jumpstart the economy. In January, the company said it will hire more than 100,000 veterans in the next five years, spend $50 billion to buy more American-made merchandise in the next 10 years and help its part-time workers move into full-time positions. Wal-Mart said earlier this week that 12,000 veterans have applied for the veterans program since Memorial Day when the plan officially kicked off. As part of its program to buy more goods in the U.S., Wal-Mart is now selling towels made in Georgia in 600 of its 4,000 namesake stores as part of its partnership with a company called 1888 Mills. It plans to roll out distribution to another 600 by September. 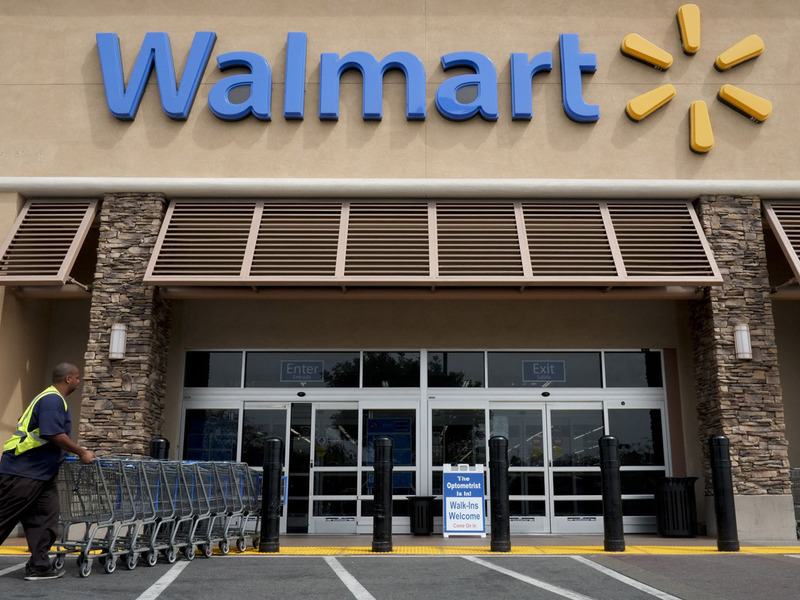 Wal-Mart is also working with other new and existing suppliers to produce basics like T-shirts and mattress covers in the U.S.
Wal-Mart is also determined to stand up to its critics that claim it doesn't treat its workers well. It has launched a website called therealwalmart.com that it hopes will do a better job in telling its side of the story about how the company is a place of opportunity for workers. It's expected to pound the message at the annual meeting that nearly 75 percent of its workers in store management positions started out in hourly positions. "This year, there are no more free shots at you," Bill Simon, CEO of Wal-Mart's namesake division, said in an address to U.S. workers at a rally on Wednesday. "We will not stand for that." A year after Wal-Mart faced strong shareholder dissent over board members in the wake of allegations of bribery in Mexico, such criticism is only growing louder. The New York Times first reported in April 2012 that Wal-Mart failed to notify law enforcement that company officials authorized millions of dollars in bribes in Mexico to speed up getting building permits and gain other favors. Wal-Mart has been working with government officials in the U.S. and Mexico on that investigation. The company has said it has been investing in fortifying controls overseas and has hired new executives to oversee compliance. That hasn't been enough to placate investors. The New York City Pension Funds plans to vote against nine of Wal-Mart's 14 board nominees at the shareholders' meeting Friday. City Comptroller John Liu's office, which oversees the fund, said Wednesday that the fund is concerned with the board's failure to comply with laws and its own policies. The fund owns 5.1 million shares, or less than 1 percent, of the world's largest retailer. The fund voted against five of Wal-Mart's nominees last year. With descendants of Wal-Mart's founder owning about 50 percent of Wal-Mart's shares, activist shareholders have little chance of voting out the board members. But the growing dissent shows a loss of confidence with the board. Meanwhile, Wal-Mart has been criticized for not signing a global, legally binding pact intended to make Bangladesh clothing factories safe. The pact has been signed by mostly European retailers including Benetton and H&M. Instead, Wal-Mart announced its own steps for increasing its monitoring of factories overseas. That includes conducting in-depth inspections at all of the 279 factories it uses in Bangladesh. It has said it plans to make the inspection information public.